Two giant pork chops, a tree laden with ripe red eating apples that don’t store well and an indeterminate eta for husband and supper led to this casserole, enough for 3 portions. Eating apples, unpeeled, cored and sliced fairly thickly – I used half a dozen, but they were quite small. It would have been half as many if I’d got the step ladder and climbed to reach the large ones. Put an oven proof large frying pan or large base casserole that can stand a hot plate on the hob at a fairly high temperature while you mix the seasoned flour in a bowl or plastic bag. Use it to coat the pork portions. Set the oven to a medium heat (about 180 degrees C). When the pan is hot add a little oil to cover the base of the pan and put in the pork slices. Cook until brown on the base and then turn over. If necessary add a little more oil for the onion before adding it to the pan – it depends how much fat has run out of your pork chops. Cook until onions begin to colour and the other side of the pork has browned. Add sufficient water (or stock or cider, I had none so used more thyme than I might have done otherwise) to cover the meat and onion, the vinegar and the herbs. Use a spatula to ensure that the meat has not stuck to the base of the pan, and the browned flour is mixed into the liquid. Arrange the sliced apple over the dish to cover it. These eating apples are really supersweet, but if the ones you have are very tart you could add a sprinkling of sugar. Bake in the oven half an hour until the apples have coloured, check that the liquid does not need topping up, cover with a tightly fitting lid, turn the temperature down (to 140 degrees C) and let simmer for another ¾ of an hour. If supper is delayed further – reduce the temperature to just under 100 degrees C.
I served it with kale and crispy potatoes. 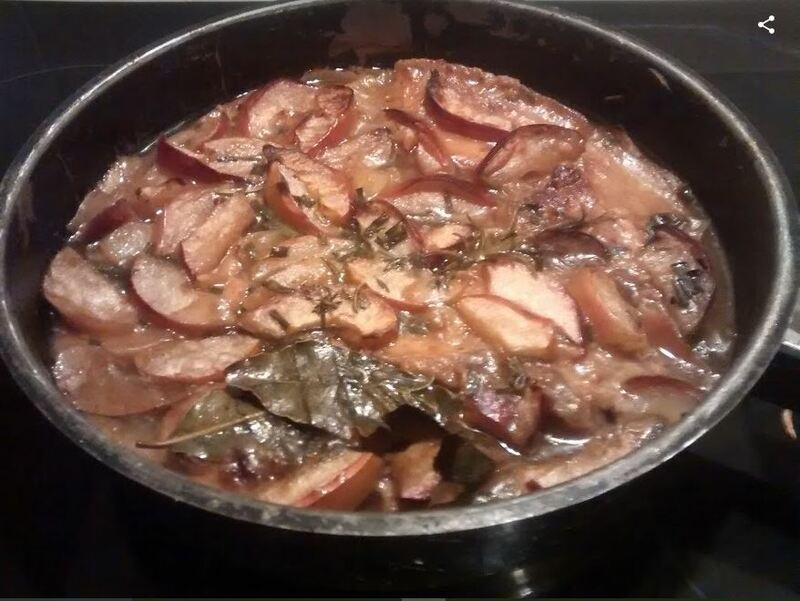 This entry was posted in cookery and tagged apple, autumn, casserole, pork, recipe. Bookmark the permalink.